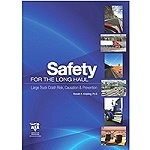 ATA Safety for the Long Haul is the first and only comprehensive resource book on large truck safety. Its 600 pages encompass 13 chapters and more than 100 specific topics relating to large truck crash risk, causation, countermeasures, safety management, and safety policy. ATA Safety for the Long Haul is written for motor carrier safety managers, other fleet managers and executives, government and industry officials, researchers, and other transportation safety professionals. This is the first and only comprehensive resource book on large truck safety. Written by Dr. Ron Knipling, a 30-year veteran of traffic safety research with emphasis on driver performance and motor carrier safety, the book’s 600 pages encompass more than 100 specific topics relating to large truck crash risk, causation, counter-measures, safety management, and safety policy It is written in a direct, informative and readable style, but with technical rigor and accuracy, and its target audience is motor carrier and transportation safety professionals, other fleet managers and executives, and government and industry officials, researchers. In 2010 Dr. Knipling received the Order of Merit, one of the highest recognitions given by the International Road Transport Union (IRU), an international organization representing highway users.